Protean's in-wheel electric motor systems could revolutionize drive train packaging and design, while making it very simple for automakers to adapt the electric drive trains to existing vehicle platforms. Protean Electric debuted its production in-wheel motor at the 2013 Society of Automotive Engineers World Congress, with Protean's CEO Bob Purcell boasting that Protean's technology is the ideal transition technology to electric vehicles. 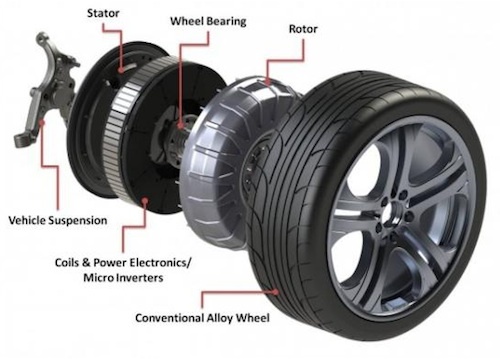 The company, bills itself as the global leader of advanced in-wheel electric drive, designs electric motors which fit into wheels enabling vehicle design simplification. In a press conference at the SAE World Conference Purcell showed a production in-wheel electric drive system. The system design is complete, and is going through final validation. The company's intention is to deliver to the market a component set that is "fully certified to all prevailing global automotive standards" and offering to the automotive industry the first plug-n-play vehicle electrification technology. At it's heart is what Protean calls an in-wheel electric motor, and others call a "hub motor." Their design is packaged as the part onto which you bolt a standard wheel, and it provides the torque exactly where it is needed, at the wheel. This model eliminates the mechanical complexity of other drive systems that require a drive shaft, transmission, differentials or gear boxes. The design is claimed to provide 75 kW (100 hp) peak power and 1,000 Nm (735 lb.-ft.) peak torque in each motor, yet each motor weighs only 31 kg (68 lbs.). This power-to-weight ratio is, according to Protean, the "Highest torque density of any of today's leading electric drive systems." The combination means an automaker could quickly adopt this technology in an existing vehicle by adapting the Protean motor as the wheel hub, do away with the drive shaft and stick the battery pack where the engine used to reside. Well, it might be a little more complicated than that, but not by much. The motor is packaged to be compatible with 18" wheels, making it a big large for the typical sedan. However this is the perfect size for light duty trucks. The company see's their technology as suitable for both OEM's to integrate into production vehicles, and conversion shops which customize trucks for commercial fleets. I would seriouly like to set up a retrofit garage to retrofit classic cars and trucks. I believe this would be a grate sales pitch for this product and would like tobe the one to get it started in my area.